HEELLLOOO everybody! Here I am with another surprise update. :) Aren't you excited? And with today being the last day of September I thought I'd squeeze in my last ABC Challenge letter for the month. So here we have the letter 'T'! 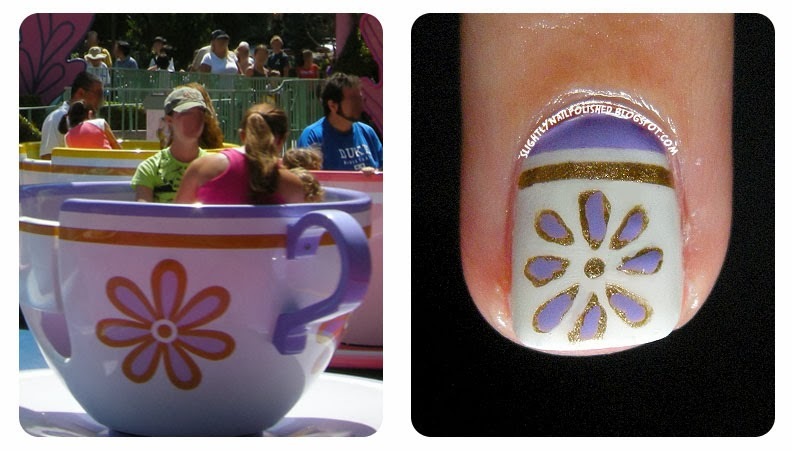 Today's' letter is inspired by one of Disneyland's most popular Fantasyland rides, The Teacups! 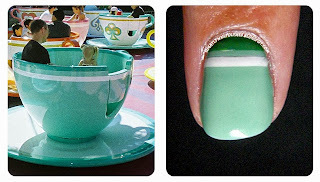 It is based on Disney's Alice In Wonderland, the 1951 animated classic, specifically the scene surrounding the Mad Tea Party. This ride is so fun! You sit in huge teacups and as the ride starts you can spin the cup with a wheel in the middle. The faster you spin that wheel the faster your cup will spin! And believe me, you can get really, really dizzy. That's the funnest part. Oh. That's right. 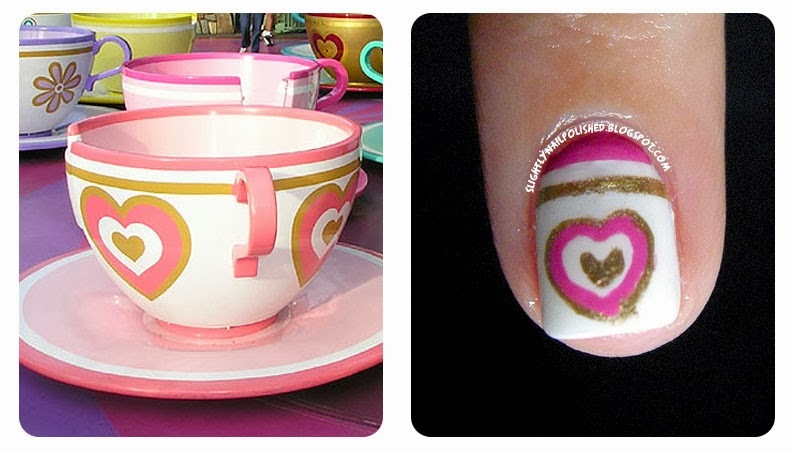 The design... Each nail is based on an actual teacup design from the ride in Disneyland, California. 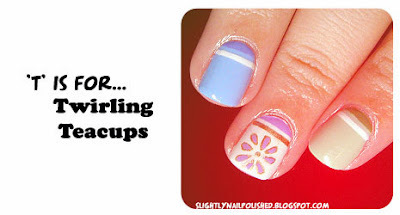 Each cup is a little different... which makes it really easy to pick out a good spinner! 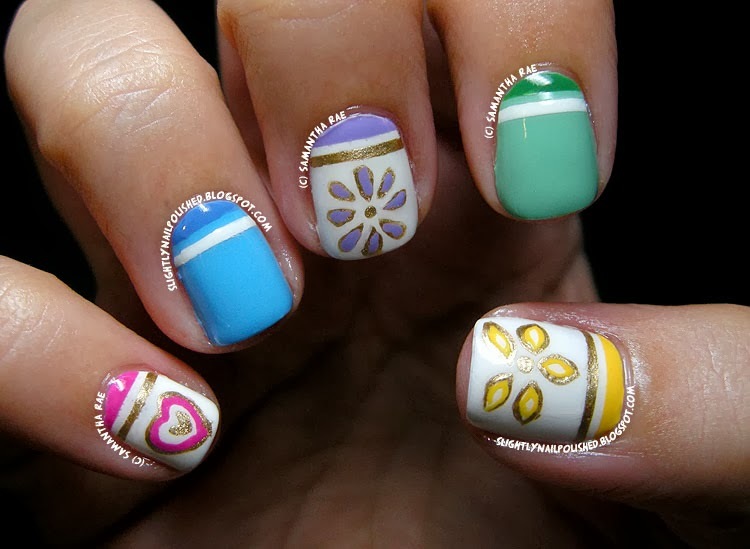 But that aside, I picked out five of my favorite designs to share with you today. 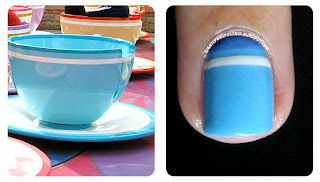 As as far as the different polishes I used, please refer to the list at the end of this post. Thanks! This pink and gold heart design is on my pinky. It's a popular cup for the little girls, for obvious reasons. I've actually never ridden in this one because it's always taken by the time I get onto the floor. But that okay. I really like the design and think it looks really cute. This is one of my favorite designs. I know it's a simple one, but it reminds me of Alice. And who doesn't like Alice?! I painted this design on my ring finger. 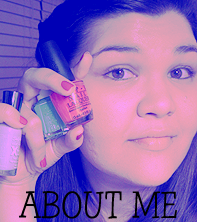 It's a little brighter in the picture than it actually is on the nail, but that doesn't mean I don't like it any less. My middle finger has the purple flower. This one is also one of my favorite teacup designs. I really like purple and gold together. A yellow, 5 petaled flower decorates my thumb. 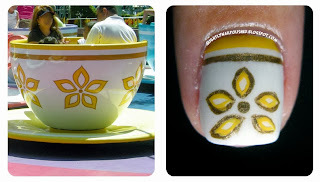 I love the bright yellow of this design. Very fun. And another quick look at the designs together. I actually really do like them. I think they're fun and represent the ride really well. They make me want to run over to the park and take a spin! I really hope you enjoyed this post. And Halloween nail designs are coming! Yay! I think Martyn from InTheLittleWood snuck his way into your opening.